Sorry it’s been such a long time! This dish takes a little bit of time, but the outcome is a nice refreshing salad. Typically, panzanella is meant for the summer, but I was just in the mood! Sprinkle salmon evenly with 1/4 tsp salt and 1/8 tsp pepper. Heat a medium skillet over high heat. Add 1 tbsp EVOO to pan. Add fillet, skin side down; cook 2 minutes. Reduce heat to medium-high; cook 4 minutes or until skin begins to brown. Turn fillet; cook 2 minutes or until desired degree of doneness. Place fillet on a cutting board. Remove and discard skin. Flake fillet with a fork into small chunks. 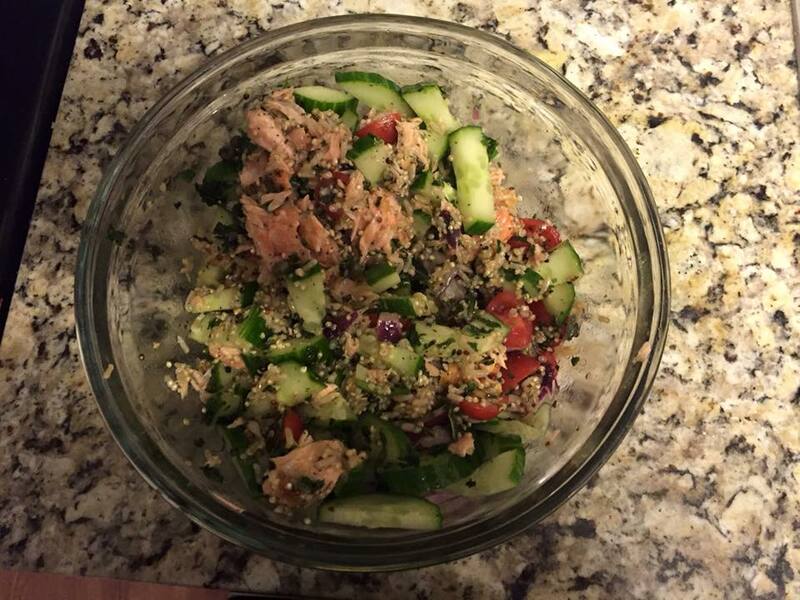 Combine flaked salmon, remaining 3/4 tsp salt, remaining 3/8 tsp ground black pepper, quinoa, and remaining ingredients in a large bowl; toss gently to combine.